Measurements: Frequency, Period, Ratio, Time interval, Rise/Fall Time, Duty factor, Pulse width, Voltage, Freq. range, Burst freq. With the new CNT-90 timer/counter/analyzer, Pendulum Instruments now offers The Ultimate Tool for measurement, analysis and calibration of Frequency, Time Interval or Phase. 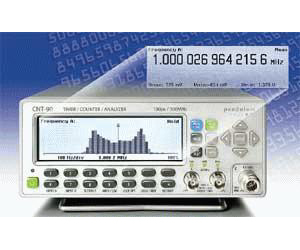 Whether in test systems, on the R&D bench, in the calibration lab or out in the field, the CNT-90 is the state-of-the-art timer/counter/analyzer and outperforms any existing counter on the market. The CNT-90 is the worlds fastest timer/counter/analyzer and offers a unique ease-of-use with graphical display and improved control over measurement at an outstanding price. The fast measurement speed of 250k measurements/s to internal memory and the big memory depth of 750k, makes Modulation Domain Analysis possible by capturing very fast frequency changes in real time. Thanks to the fast GPIB measuring rate of 2 k/s (increases throughput with up to 10 times compared to today’s solutions) the CNT-90 can save lots of time (and money) for customers in test systems. The high resolution of 100 ps (time), 12 digits/s (freq.) and 0.001° (phase) follows very small time and frequency changes that are vital for R&D and Production testing. CNT-90 gives 2 more digits than other interpolating counters. The menu-oriented settings reduce the risk for mistakes. Valuable signal information given as numerical results up to 14 digits with auxiliary parameters removes the need for other instruments like DVM’s and Scopes in time & frequency measurements. The unique gaphical presentation of results (histograms, trends, modulation etc.) gives an understanding of random signal distribution and measurement changes vs time, from slow drift to fast jitter and modulation.